Space2Place – an online training environment, developed at the Department of Geography – Research Group for Earth Observation (rgeo) at Heidelberg University of Education, will empower UNESCO sites managers and planning authorities to incorporate Sentinel data from the European Copernicus programme to improve documentation, monitoring, planning, and management of respective sites. Earth observation tools have been identified as useful means for various issues such as documentation, monitoring, planning, management, and evaluation of UNESCO sites and their surroundings. Main benefits are time and cost savings, provision of near-real time information, quality improvements by increased accuracy of information, better informed decision-making and planning as well as enhanced control of processes and measures. Furthermore, Earth observation techniques are evolving on a fast track and there has never been a better time for using these datasets. Implemented by the European Commission, the Copernicus programme is producing vast amounts of global data in order to support service providers, public authorities and international organizations with valuable information. These information come free and open accessible to its users. The core of the Copernicus programme is a fleet of Sentinel satellites. This fleet consists of already started radar satellites (Sentinel 1) and high-resolution optical satellites (Sentinel 2) up to planned missions for atmospheric composition monitoring (Sentinel 5) and global sea surface height measurements (Sentinel 6). These Earth observation techniques offer a wide range of possibilities, but are rarely used by UNESCO sites managers or related planning authorities. The deficient implementation is often justified with the complexity of satellite image analysis as well as high costs in terms of time and organization efforts. The increasing number of UNESCO World Heritage sites, Biosphere Reserves and other UNESCO related sites show high potentials to use remote sensing data for monitoring, evaluating, and visualizing environmental changes. Some of these sites are assessed by UNESCO to be in danger, showing that an improved management is of urgent need. Regardless of the underlying causes, ranging from environmental processes, climate change or manmade destruction, considerable degradation can be monitored on a number of different Cultural and Natural Heritage sites, Biosphere Reserves etc. (UNESCO, 2009). Many of these affected sites can be found in the global south, suffering from conflicts, poor economic, social or political conditions (http://whc.unesco.org/en/danger/). However, they play a decisive role within the UNESCO sites network. The adaptive e-learning environment Space2Place, developed by rgeo and the UNESCO Chair on World Heritage and Biosphere Reserve Observation and Education, won the “Space Oscar” in the category University Challenge at the Copernicus Master 2016. The aim of Space2Place is to empower UNESCO sites managers to access and use Copernicus datasets as well as to spread the benefits of modern Earth observation techniques. Participants of the modules will understand the benefits of modern Earth observation techniques and get an overview of the various applications. Thereby, site managers are enabled to formulate their needs and demands for their UNESCO sites. The e-learning module consists of 20 learning units, focusing on the introduction to Earth observation, image enhancements, classification and change detection methods. It has several connection points to the online remote sensing software BLIF. Furthermore, in various units different examples of applications are given. Small and simple quizzes within the module will evaluate the learning progress of participants. At the end of the module if the quizzes were successfully answered, a certificate is given to participants. The course is open, free to access and will be launched at the beginning of 2018. 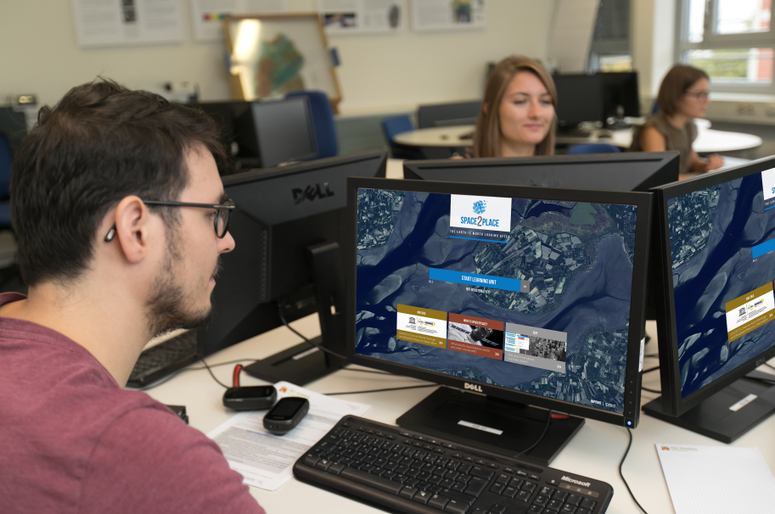 The basis for the e-learning environment was set with the former rgeo research project Space4Geography , funded by the German Space Administration (DLR). National educational standards in Germany include already remote sensing methods, which can be found e.g. in state curricula and school books. However, at the same time a considerable lack of implementation was detected in a nationwide curricula analysis. Space4Geography aims to improve the implementation of modern satellite technologies for Earth observation by addressing various environmental and geographical issues with the help of remote sensing, instead of talking solely about remote sensing methods itself. Project results consist of ten different learning modules. Every module addresses a different geographical aspect, ranging from urbanization and megacities up to water conflicts on Tenerife and deforestation in the rainforest of Brazil. By using real satellite images such as Landsat, RapidEye and TerraSAR-X, the competencies in analyzing satellite images are directly improved. The adaptive system of the e-learning platform allows students their own individual learning path by adjusting the content and difficulties to their individual abilities and needs. With nearly 2.000 attended students, Geospektiv is already widely used by addressed primary and secondary school classes. All modules are interlinked with the web-based remote sensing software tool BLIF (Remote Sensing in Focus - http://www.blif.de/), also developed by rgeo, Department of Geography. The web application is enabling students to work and analyze real remote sensing data independently on a problem-oriented geographical question. Included technical features range from basic tools, editing and typical image processing features up to tools for manual and automatic classification. Currently only a single learning module is available in English, specifically designed for site managers and other stakeholders. On the basis of cooperation’s with the UNESCO and other institutions, it is planned to offer more diverse courses in future. This includes an e-learning module for the documentation and monitoring of cultural heritage sites by 3D data acquisition. Another will focus on the interrelation between Earth observation techniques and health, e.g. for malaria control programs.